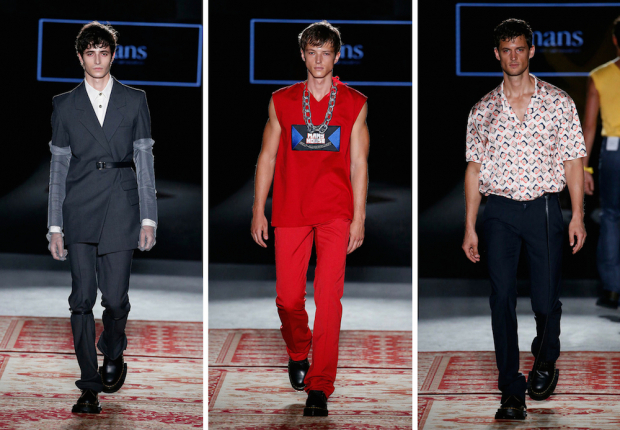 The young designer Jaime Álvarez wins the 080 Award to Emerging Design two times in a row with his proposal “Mans House” for spring-summer 2019 presented at the Sant Pau Modernist Enclosure within the 22nd edition of the 080 Barcelona Fashion catwalk. In this new menswear collection, the creator is inspired by the Berlin in the nineties, when the new generations embraced freedom after the fall of the Berlin wall. The collection presents formal looks, of exquisite tailoring, in a sober palette dominated by grey, brown and beige and classical prints like pinstripes and Prince of Wales. Mans Concept Menswear breaks this apparent gravity with more casual looks and neon colors, like yellow and green, that are a clin d’oeil to the fizziness of the Berlin post-wall.